The booster, meanwhile, plunged back to the launch site tail first, re-starting its hydrogen-fueled BE-3 main engine to slow down, deploying four legs and settling to a picture-perfect touchdown on a circular landing pad. 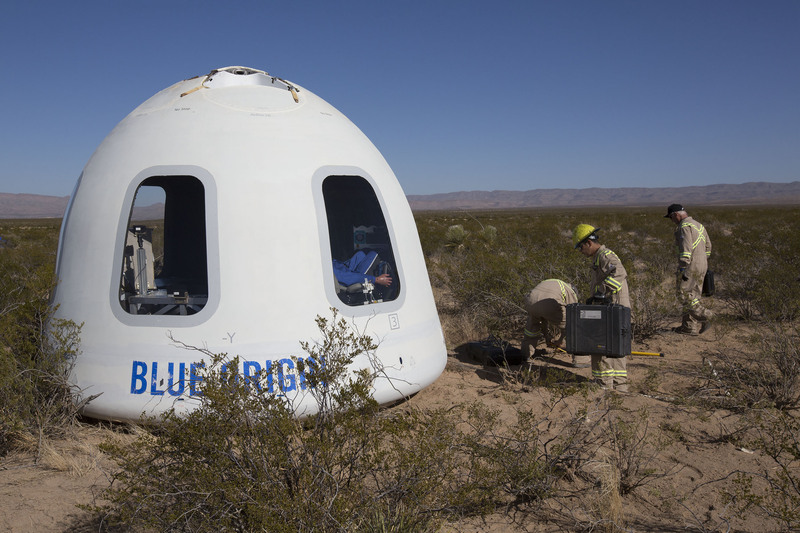 The launching, the first using an upgraded booster and a crew capsule equipped with the large windows that will offer space tourists spectacular panoramic views, was carried out in secrecy and Blue Origin did not acknowledge the flight until around 11 p.m. EST. 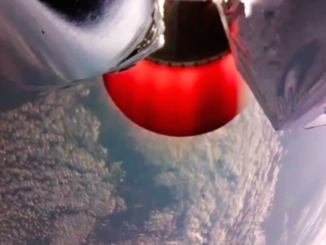 An edited video, available on YouTube, showed the hydrogen-fueled New Shepard rocket blasting off on a brilliant jet of flame and climbing straight away through a deep blue sky. 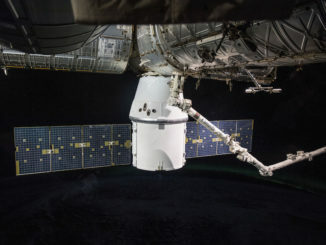 The crew capsule was released after the booster’s engine shut down, soaring to an altitude of 322,000 feet — about 61 miles — before arcing back toward Earth. Small drogue chutes deployed to stabilize the spacecraft followed by three large chutes that slowed the ship for a gentle 1-mph touchdown near the launch site. 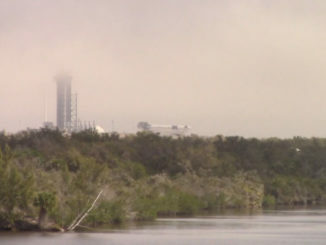 The booster, flying on its own, steered itself back to a rocket-powered touchdown, kicking up a cloud of dust as it descended to an on-target landing. It was Blue Origin’s seventh New Shepard flight overall and it’s sixth success in a row. It was the company’s first test flight since a dramatic launch Oct. 5, 2016, that simulated an in-flight abort and its first using a new, upgraded booster and a crew capsule equipped with windows. Blue Origin is developing the reusable New Shepard rocket and spacecraft to carry up to six space tourists, researchers and/or experiments on brief sub-orbital flights above the discernible atmosphere more than 62 miles up, or 100 kilometers. That’s the somewhat arbitrary but widely recognized “boundary” of space. Once released from the booster, passengers in the relatively spacious crew cabin will experience four to five minutes of weightlessness as the spacecraft arcs over and begins falling back to Earth, enjoying a spectacular panoramic view through the largest windows ever designed for spaceflight. Plunging back into the dense lower atmosphere, passengers will experience up to five times the pull of gravity at sea level before the parachutes deploy for landing. Assuming continued testing goes well, Blue Origin hopes to being launching passengers within the next year and a half or so. No word yet on how much a ticket might cost.